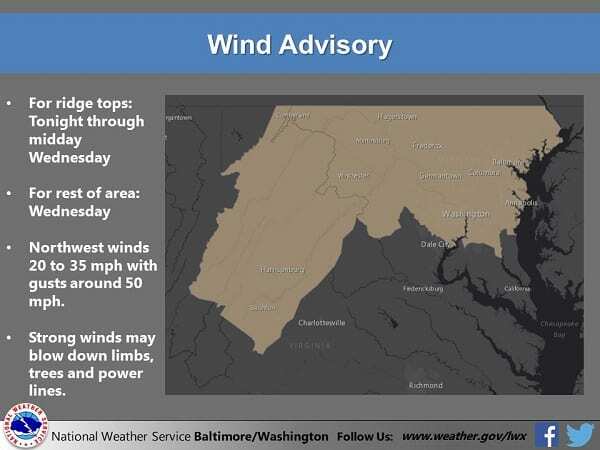 The National Weather Service has issued a Wind Advisory for the Nottingham area on Wednesday. Gusty, northwest winds are expected throughout the day, although winds could pick up as early as Tuesday night. Steady winds of 20 to 35 mph are forecast, with gusts of up to 50 mph. Strong winds may bring down limbs, trees, and/or power lines. Temperatures will likely not get out of the 30s on Wednesday.